As mentioned in this talk the main concurrency features Go provides are goroutines and channels. While these constructs might seem pretty simple they are immensely powerful and one can use them to build advanced systems. One such system is a pipeline as described in this blog post. What I think is really awesome about the system described is that downstream functions can signal to the upstream functions to stop producing values, while still keeping the code easy to understand and not horrendous. 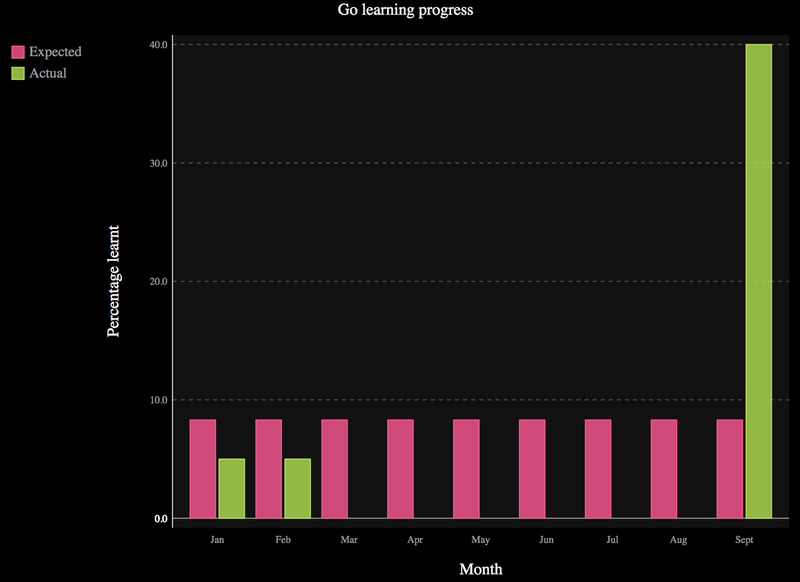 One of my goals of 2014 was to learn a new programming language, and for various reasons I decided on Go. While my learning progress has been pretty terrible for most of the year, I was able to make pretty good progress this week. What made me get to 40% this month? Several things, but by far the most important one was A Tour of Go. I feel that the Tour could be improved by adding three things – syntax highlighting to the code in the console, more exercises, and including solutions to the exercises. Apart from that, I think it is a perfect learning resource. My thoughts on Go? I think it is an interesting language, and something that I will most certainly delving into more. I’d read some Go code before (mostly Docker code) so I was vaguely aware of what the language looked like. I was initially a bit hesitant about the fact that Go has both high level (e.g. functional programming) and low level (e.g. pointers) features, but I think I quite like this ability to have and use both. The concurrency primitives look excellent, and I can’t wait to write some code using it. Another thing that scared me a little was the lack of classes, but structs + interfaces seem to be powerful enough to deal with that. I’ve read online about Go’s lack of generics being a problem, but I haven’t written enough code in Go to comment on this issue. I really liked the fact that the Go compiler doesn’t allow you to compile code that has unused imports or unused variables. Next steps – read Go by Example and An Introduction to Programming in Go, and begin writing Go code to implement the two phase commit protocol. Author karanparikhPosted on September 28, 2014 September 28, 2014 Categories UncategorizedTags Computer Science, goLeave a comment on Let’s Go.